The Nigeria Navy (NN) has contracted the China Shipbuilding and Offshore International Company (CSOC) to upgrade its naval dockyard into at Port Harcourt into a world-class factory that will build offshore patrol vessels (OPVs) and carry out maintenance on vessels. The Chinese company, which won a contract to build two 95 metre P18N OPVs for the Nigerian Navy in 2009, is scaling up the facilities to enable it to do the remaining construction works on the vessels locally in Port Harcourt. Nigerian Navy chief of Policy and Plans Rear Admiral Emmanuel Ogbor said the upgrading of the shipyard is part of the navy’s drive to develop a local ship-building capability and an industrial base capable of maintaining the country’s naval vessels. “Localising building of naval vessels in Nigeria will make more naval ships available for patrol and protection of critical offshore infrastructure in Nigeria’s maritime domain for the benefit of all,” Ogbor said. CSOC representative Xu Qui said the first phase of the project will entail construction of a new jetty and other facilities for the repairing of ships up to 5 000 dead-weight tons (dwt). The second phase will focus on the construction of a new dry dock and auxiliary facilities with a capacity to build and repair offshore patrol vessels and 5 000 dwt ships. The third and final phase will see the setting up of a fully modern shipyard capable of building and repairing offshore patrol vessels, offshore platformss and seafaring vessels of up to 10 000 dwt. 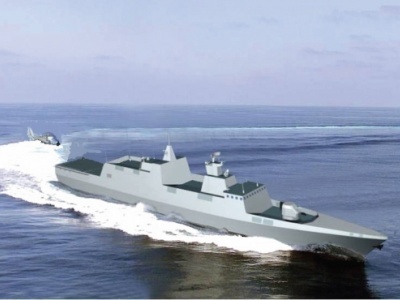 According to Jane’s Defence Weekly, the first Chinese-built OPV is being built at the Wuchang shipyard in Wuhan and is expected to be delivered to Nigeria in mid-2014. The second vessel is also set to arrive in Nigeria in 2014, and will be completed either later next year or in early 2015. According to Jane’s, the NN dockyard has already produced a 31metre long Seaward Defence Boat (SDB) and is using the experience gained to build a larger, 38-metre long SDB and a 16.56 m, 92 ton naval tug. The dockyard previously built a 90-passenger naval ferry (Sauka Lafiya) in 2009.
International interest in Nigerian ship-building has grown of late with Singapore-based Suncraft International offering the NN two low-cost ship designs – one for a 60 metre long vessel with a helicopter pad and the other for a 90 metre long vessel which has an integral hangar. Suncraft has delivered at least a dozen 17 metre Manta and two 38 metre patrol craft to the Nigerian Navy, which will soon receive two Ocea FPB 98 patrol craft. Many of the Nigerian Navy’s vessels are in poor condition due to lack of maintenance, but the Navy is embarking on a highly ambitious expansion programme that aims to acquire 49 naval vessels and 42 helicopters over the next decade. A number of vessels have been delivered over the last several years, such as the ex-US Coast Guard Hamilton class cutter NNS Thunder, and dozens of inshore patrol vessels. The Nigerian Navy will receive two more ex-United States vessels in 2014/15, the US Navy Survey Ship John McDonnell and the US Coast Guard Cutter Gallatin.